What a day for the Mariners! Not only did they win their seventh straight game, they did it behind Blake Beavan who pitched deep enough into the game to walk away with the win. Beavan gave up two solo homers and a sac fly in 7.2 innings as Lucas Luetge got the last out in the 8th and Tom Wilhelmsen closed the game with a nice little bow. The M's were trailing 2 to 0 until the bottom of the fourth. With runners at first and third, Jesus Montero grounded into a double play that allowed Dustin Ackley to score. Not the greatest way to score a run, but the M's were on the board and trailing 2 - 1. Trailing 3 to 1 in the bottom of the 5th, Mike Carp hit a two out single and was aboard for Eric Thames. Making his Mariner debut, he was looking to impress. With the count 1 and 2, Thames hit a slider hard and deep. The ball landed deep in the seats in right center and Thames circled the bases with the score tied at 3. The Mariners added a run in the 6th on a John Jaso single that scored Michael Saunders and they added another in the 7th when Dustin Ackley singled home Brendan Ryan. They came from behind, continued to add on and got the win. That is the first time I've seen them do that all year. All of a sudden, the Mariners have a home record of 8 and 2 since sending Ichiro Suzuki to the Yankees. 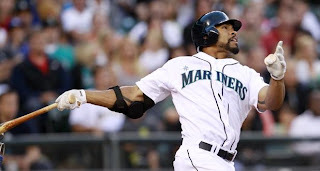 There are a lot of moving pieces in the organization still and we still won't be able to tell where this team will land with all their decisions in the outfield, but tonight, Eric Thames made the Mariners forget the name Carlos Peguero. Sad to say, but if Thames is anything like Jack Z thinks he is, Eric Thames would become our new left fielder. As Mariner fans it's hard to get attached to any players at the moment. Even if you know they are going to make the big leagues, you don't know how long they will wear a Mariner uniform. I like a lot of these guys and hope they all do well, but no matter how you slice it, there are only 25 spots on the roster. May the best man win!